Wyntharë; which means "‘Home in the West" in the Silvanestri tongue, was one of three elven nations formed after the Sundering and was the original home of the Grey-Elves of Corwyn. Wyntharë was devastated by the Great Rift of 884/3 and collapsed soon after. When the great Silvar realm of Ectharë collapsed at the end of the Second Age, it broke into three smaller and distinct Elf-realms in an event called the "Sundering." 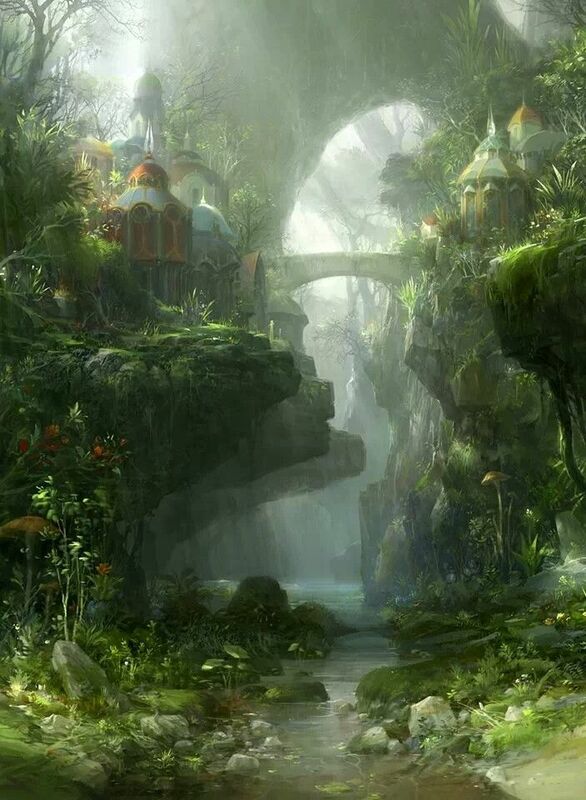 The far-western Elf-realm was called Wyntharë, which meant "‘Home in the West" in elvish. The elves of Wyntharë were the most reclusive and powerful of the three groups. The Grey-Elves' mastery of magic knew almost no bounds, and some say it surpassed even the greatest of talents of the Saar and the Council of Sorcerë. These western elves eventually evolved into the Elf race known today as the Grey-Elves, or ‘Grafyr,’ of Corwyn. Their skin was pale, their hair silver or gold, and their eyes were bright amber gold, pale grey, or even a deep violet purple. These elves were the shyest of elvish races and found no joy in even the smallest contact with other races, and had such meetings only rarely. The Grey-Elves that founded Wyntharë were led by the beautiful Queen Ariel, who had been a powerful mage in Ectharë. In the small forest city of Starfall, the Grey-Elves founded the Veiled Throne of Wyntharë, although only two elves at upon it. Little else of their exotic culture is know today, except that the Grey-Elves built a marvelous civilization far in the Westvale, with secrets still unknown today. In the year 884 of the Third Age, the Elven homeland of Wyntharë was struck by the Great Rift; a terrible earthquake that left most of the Grey-Elf population dead or maimed. The earthquake also completely devastated their three greatest cities; Alarë, Selunë and Wyn Falas. All three grey-elf cities were either consumed by the sea, or left in complete and total ruin. After this catastrophic event; Ajathar and many of his folk became bitter and morose. The few surviving Grey-Elves of Wyntharë began to yearn to return to their ancestral homeland of Eryn Norvë. It was for these reasons, Ajathar and most of his people eventually left Corwyn, never to return. A few Grey-Elves decided to remain. Those few moved south to Vesarivon Isle and formed an enclave around the ancient, ruined city of Starfall. They called their new home: Antharë. Within less than five-hundred years, the entire region known today as Westvale Island was abandoned by the Grey-Elves, leaving their beautiful city of Wyn Falas empty and abandoned. This city and the lands surrounding it eventually became inhabited by early tribes of humans called the Iskari, and eventually became the human kingdom of Cyrendar in the early Fourth Age. The few remaining Grey-Elves that remained on Corwyn settled far to the south of the Westvale, in a region known today as Antharë, a deep forested enclave of the Grey-Elves. Wyntharë remains the least understood and most mysterious of the ancient lost civilizations on Corwyn. The symbol of the Grey-Elves of Wyntharë was a silver ship, surrounded by a ring nine silver stars, on a pale lavender field. The Elf-realm of Wyntharë encompassed the territories of what are today the realms of Cyrendar and the Elf-realm of Antharë.